You may not even think about your sink stopper until it breaks. A sink stopper is the metal plug that prevents water from going down the drain in a tub or sink when you pull the rod on the faucet. When the mechanism fails, water goes down the drain whether you want it to or not. Living without a functioning sink stopper makes you realize how necessary this modern convenience can be, but don't rush to call the plumber. You may well be able to tackle this task yourself. If your bathroom sink pop-up stopper won't close, it is virtually impossible to fill up the tub or sink, and it's easy to lose small items down the drain. When the sink stopper is stuck closed, draining out the water is a challenge. Either of these problems can make you tear your hair out. In truth, modern sink stoppers are efficient and effective when they work, and they can be simple to fix when they break. Before you jump into sink stopper repair, you need an overview of the mechanism. A sink stopper is usually raised or lowered using a lever or a knob on the faucet. That lever is connected to a flattened bar called a clevis that connects to a pivot rod, a horizontal rod that passes through a rubber pivot ball and then slopes up to attach to the bottom piece of the stopper. It is the rod that pushes the stopper up or drops it down to close the drain. If you are wondering how to fix a bathroom sink drain stopper or a tub stopper, the answer depends on what exactly is wrong with it. Your first job in all cases is to clear out the area below the sink so you can get to the assembly. This area can get messy, so take everything out to give yourself access. Now, look at the pivot rod. It is horizontal and connected to the clevis. Find the nut that holds this rod in place and loosen it, and then remove it from the drainpipe. Use a permanent marker to draw an X where the clevis is connected to the stopper rod. Loosen the clevis screw and clean out both the clevis and the pivot rod, removing all hair from the area too. Clumps of hair on the pivot rod can prevent the stopper from sealing well. Then, take the stopper out of the drain and take a close look at the rubber seal on the bottom. This seal can get dried out or brittle, and it can crack. It's no problem if that's the case. Just take the piece to the hardware store and buy a replacement seal. Now, it's time to put it all back together again. 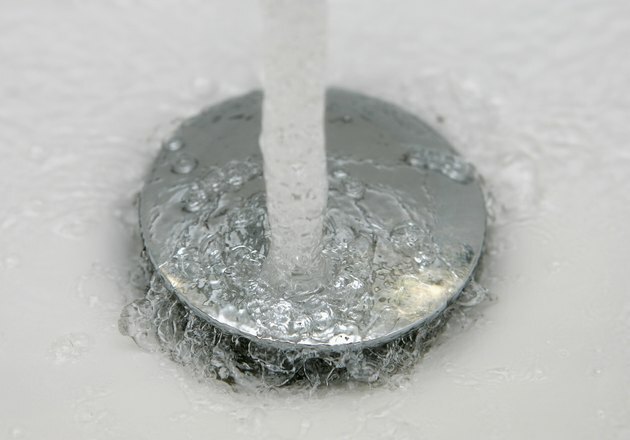 The sink stopper replacement starts by inserting the stopper into the drain. Slide the clevis (the flat-slotted bar) over the pivot rod, and then push that rod into the drain. Replace the nut you removed from the horizontal rod, but tighten it only lightly, just enough to hold the rod in place. Then, go back to the clevis screw. Tighten it in the location where you marked it. Now, test out the mechanism. When you pull the stopper rod, the pivot rod, the clevis and the stopper should all move. If the seal isn't tight enough, adjust the retaining nut and the clevis screw until it works well.